This season of Doctor Who has been quite the insane ride. Almost all stories that were two-parters, and a final story that’s a three-parter. That’s something we haven’t seen since season 3’s trilogy of Utopia/The Sound of Drums/The Last of the Time Lords rocked the Whovian’s world with the Master’s return. Hell Bent takes it even farther than Face The Raven and Heaven Sent in sheer audacity and heartbreaking moments. All of that comes down to Peter Capaldi and Jenna Coleman’s performances in this episode. While the writing has been almost without exception fantastic for the last few weeks, you can’t sell the story of a love that spans centuries without two people who have the chemistry to pull it off. As has been repeatedly shown throughout the series, while the Doctor and Clara clearly love each other, their relationship became dangerously co-dependent. And as the story Moffat has penned goes to great lengths to point out, that bond could endanger everything. While fans can appreciate the reference to Donna’s final fate in Journey’s End, that reversal means everything. 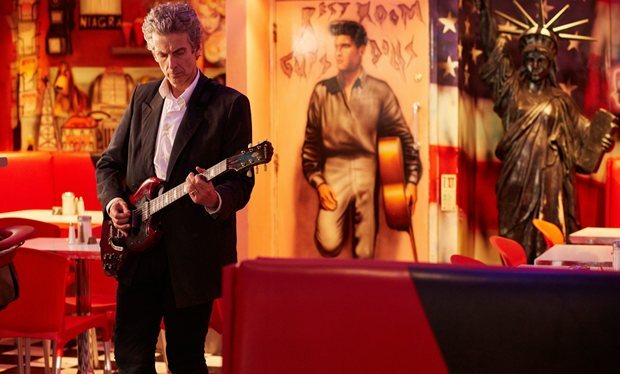 While Clara needs her own evolution in order to be able to be the person she became, the Doctor can’t continue on with the pain of losing someone who meant so much to him, and also pushed him to the dangerous places that he enters in this episode. It’s something to behold how Capaldi has so smoothly defined his incarnation of the Doctor from Series Eight’s mixed results, to the one we see here today. Capaldi has some of the high brow smugness of Jon Pertwee’s Third Doctor, but he also has every bit of the melancholy and heartbreak of David Tennant’s Tenth Doctor. That last bit is what defines his incarnation here as he shifts from defiance, to wrath, to desperation in his attempts to bring Clara back to life. Steven Moffat’s framing device of the Doctor telling Clara the story of her that he pieced together from his lost memories is probably one of his more clever ideas for a story, and as it shows with the end reveal that the Doctor himself forgot about Clara, it adds a layer of poignant resolve when the rug is pulled from underneath him and he’s forced to move on.